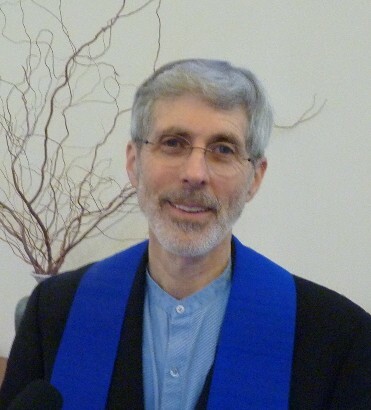 The Unitarian Universalist Congregation of Salem is committed to the environment. One of the congregation’s guiding principles is respect for the interdependent web of life. This guiding principle helped set the stage for the Unitarian Universalist Congregation, through the work of the Green Team, to earn its Marion County EarthWISE certification in 2015. 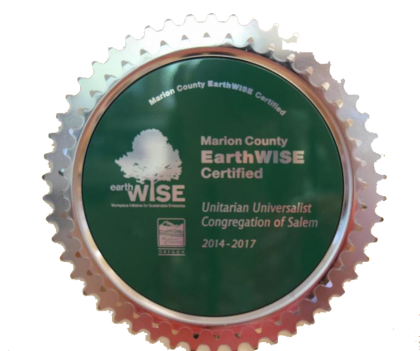 UUCS is one of 160 EarthWISE businesses and organizations in Marion County. To earn certification, business meet criteria in water conservation, recycling, waste reduction, energy usage and other categories. UUCS has an intensive recycling system. All of the typical mixed recycling is available for office staff and congregation, but staff members also save all of the fluorescent bulbs to take to the transfer station. While recycling has taken pressure off the congregation’s already small amount of garbage each week, waste reduction has played a larger role. Instead of mailing the newsletter 12 times per year, officials opted for an e-mail newsletter with subscribers having to opt-in for a paper copy. of the 250 people in the congregation, only 50 opted for a paper copy, a reduction of 80 percent. Then the congregation reduced even more by reducing the size of the program at each of the two Sunday services —from a legal size with an insert to one 8 1/2 by 11 sheet of paper. A paper news insert that had been handed out to all congregation members has now been reduced to 15 copies that are shared during the social hour. These actions reduced paper use by 35 percent and the reduction in paper newsletters cut mailing costs by 75 percent. Waste in the kitchen was reduced by stocking durable dishware, which is used during the social hour after each service. Since the kitchen also is available for rent, anyone using the space has access to reusable mugs, plates and silverware. In the kitchen, all of the coffee grounds and fruit and vegetable scraps are composted and used in the raised beds that used to be part of the flower border. The congregation’s children help plant, tend and harvest the food in the garden —educating the next generation about sustainability. Energy conservation is another area where UUCS has taken great steps to minimize its environmental footprint. As the fluorescent bulbs throughout the building burn out, they are replaced with LED lights. the large globe lights at the entrance to the building recently were replaced with LEDs, making a dent in the electricity bill for the congregation. The outside lighting is on motion sensors, and automatic thermostats control heating and cooling zones. The congregation saves water with the low-flow toilets that wee installed in 2015 and aerators keep water use to a minimum on all faucets. Because UUCS officials understand the connection between environmental and human health, all of the cleaning supplies used in the church are completely non-toxic products. Products such as baking soda and vinegar are the main cleaning agents in the facility. For more information on the Marion County EarthWISE program visit their website, or call 503-365-3188.